Luxury/loaded condo. One of the few OVERSIZE UNITS in the condo complex! (1480 sq. feet) : Additional square footage in the 2nd bedroom and livingroom. Bedding accommodations: King (master with ensuite), 2 QUEENS (2nd bedroom), QUEEN SLEEPER SOFA, ROLLAWAY & CRIB. kitchen island dining with bar stools. Total of 3 color Tv's in unit. (2 flat screens) Outdoor table & chairs on the porch for outdoor dining. 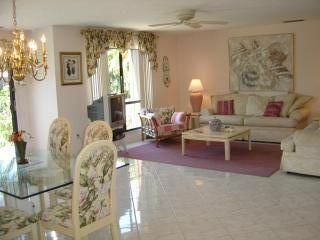 We have owned and rented condos in this condo complex since 1983! As property owners, we are extremely responsive to our guests needs and upgrade something in the unit every fall. We are one of the few oversize units in the condo complex of 108 units. Our unit has larger sq. footage in the livingroom and guest bedroom which allows larger bedding accommodations. (King, 2 Queens, queen sleeper sofa, crib & rollaway. Unwind immediately. Luxury loaded condo. One of the few oversize units. Extra sq. footage (1480) so there is extra space in 2nd bedroom & livingroom. 3 couches, flat screen tv's. Tv's in every room! Fully equipped kitchen & laundry off the kitchen. 2 adult bikes for you to use in unit and canoes & kayaks for free use. Toys, pool noodles, beach chairs. Internet service. We have a large amt. of happy repeat renters. Open sunning patio. Extra sets of dishes & tableware. toilet, shower, Bathroom outside 2nd bedroom with large shower for two! Condo in complex on Bowman's Beach. View of pool, clubhouse, tennis courts. Complex is on Bowman's Beach on the island. Condos do not have direct ocean view as there are sea oats blocking and turtle hatching areas. No fee for linens. Owners pay for linen fees. Covered carport available. Parking permit provided. Guest spots available on first come, first served basis. Fitness center available on the island. Large screen tv. Couch (queen sleeper sofa), 2nd couch, and comfy chair. Entertainment unit with board games and videos. Stereo and radio. Cable by Century Link with large number of channels. stove, refrigerator, dishwasher, garbage disposal, washer & dryer off the kitchen in the unit. Large pantry space available. Large amt of dishes and pots & pans. dining table with 6 chairs, 4 additional chairs at breakfast island bar, table outdoors with chairs. All rooms have flat screen tv's. Century Link cable with lots of stations. Free use of our canoes and kayaks. Use of free 2 adult (women) bikes. (located in walk in closet). public golf courses on island and 30 total in Lee County. Extras Include: Bikes (2 adult bikes), beach chairs, beach towels, tennis rackets, pool toys (noodles, sand pails, etc. ), video library with over 100 films, fully equipped linens, pots & pans, games, blender, mixer, electric frypan, electric juicer, icemaker in refrigerator, booster chair. peruse, SunSplash waterpark, flea market. Trolley rides, bike rentals (we have 2 adult bikes in our closet). Free canoe & kayaks to check out at the clubhouse. Wildlife rescue center, turtle hatching & classes; beach walks with guide, farmer's market.